Plot: A young woman disenchanted with love mysteriously finds herself trapped inside a romantic comedy. Starring: Tom Ellis, Priyanka Chopra, Rebel Wilson, Liam Hemsworth. 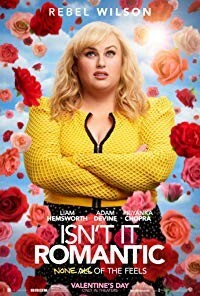 distributed by Warner Bros. (New Line) «Isn't It Romantic» in the US movie theaters released on February 13, 2019 and has grossed over $48 million worldwide; dvd and blu-ray release date was set for May 21, 2019. Rent from Netflix and Redbox from May 21, 2019. «Isn't It Romantic» in the UK has no theatrical release date. DVD and blu-ray release date is not available at this time.